This post was published at Zero Hedge on Sep 14, 2017. 1) Financial analysis of the three way relationship between interest rates, inflation and the U. S. national debt. 2) Higher interest rates causing higher interest payments on the $20 trillion national debt would ordinarily cause soaring deficits over time. 3) Detailed analysis of the “loophole”, which is that if inflation even moderately increases – then interest rates can rise without exploding the real debt. 4) This simultaneous increase in interest rates and inflation would have a major impact on all markets, as well as long term retirement planning. 5) The logical response to rising interest rates may be to sharpen one’s focus on how to better deal with higher rates of inflation over the long term. Because of the $20 trillion size of the total U. S. national debt, the Federal Reserve acting to increase interest rates would ordinarily create severe financial problems for the government over time, due to sharply rising interest payments on the debt. There is, however, a loophole for the federal government. 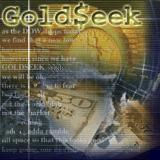 This post was published at GoldSeek on September 14th, 2017. Trinity County Waterworks District No. 1 west of Redding and Niland Sanitary District from Imperial County are in line to become the third and fourth government agencies to break with CalPERS over the past 12 months in a manner that shortchanges their retirees. The CalPERS Board of Administration is scheduled next week to vote on ending contracts with the two small districts because they’re in default. Breath-taking differences in a vast country. San Jose-Sunnyvale-Santa Clara, which is the southern portion of Silicon Valley and includes Palo Alto. San Francisco-Oakland-Hayward, which includes five counties (San Francisco, Alameda, Marin, Contra Costa, and San Mateo) that make up the northern part of Silicon Valley, San Francisco, parts of the East Bay, and a part of the North Bay. These two are also the metros that had the highest median household incomes in the US in 2016, of $110,040 and $96,677 respectively. This post was published at Wolf Street by Wolf Richter ‘ Sep 14, 2017. Are we seeing early signs of an “Arab Spring” coming to Saudi Arabia, or will the next king emerge stronger than ever? The kingdom is now in the midst of an unprecedented crackdown of both dissidents and even loyalists perceived as less than enthusiastic about Crown Prince Mohammed bin Salman’s consolidation of power as he prepares to ascend the throne of his aging and increasingly senile father. It was only last June that King Salman shocked the world by suddenly and unexpectedly removing next in line for the crown Muhammad bin Nayef, which made Mohammed bin Salman heir apparent to the throne. In the past week, Saudi authorities have detained more than 30 people, roughly half of them clerics, according to activists and people close to those who have been detained. The campaign goes beyond many of the government’s past clampdowns, both in the scope of those targeted and the intense monitoring of social media posts by prominent figures. It is not known if any charges have been filed. “Greater love has no man than this, that he lays down his life for his friends. You are my friends, if you do what I ask of you. No longer do I call you servants, for the servant does not understand what his master is doing. But I have called you friends… This I command you, that you love one another. Tomorrow is a stock options expiration. This post was published at Jesses Crossroads Cafe on 14 SEPTEMBER 2017. It may be that was the real reason, for Fischer was no spring chicken. But even in public there is a noticeable and growing rift on the topic of inflation. For some policymakers, there is every reason to suspect the Fed has it all wrong. Others figure that something may be off, but that it won’t be off forever. We just don’t know at this point whether the inflation decline that we’ve seen is mostly being driven by transient, idiosyncratic factors, or whether it’s something more secular, longer-term at play. My view is the jury’s out, and I think the data over the next six months is going to be very, very important. This post was published at Wall Street Examiner on September 14, 2017. This post was published at Harvey Organ Blog on September 14, 2017. President Donald Trump likes a weak dollar. A weak dollar helps stimulate manufacturing, limits imports, and maximizes exports, among other economic boons. But China likes it, too. That’s because the dollar’s nosedive this year has created the perfect conditions for China to gobble up U. S. debt. The Red Dragon has increased its holdings of U. S. Treasury securities by over 9% since November, while the U. S. Dollar Index (DXY), which measures the value of the dollar against a basket of six major currencies, has fallen 9% over the same period. And now that Trump has agreed to extend the U. S. debt limit to Dec. 15, Chinastands poised to increase its holdings even further. In perhaps the most ironic story of the week (so far), a leaked White House memo to Buzzfeed News reveals that National security advisor H. R. McMaster urged senior government officials to warn agency employees against leaks of both classified and unclassified information. ‘For those with access to classified information, a review of the non-disclosure agreement reminds us of the responsibilities that come with access to, and penalties for unauthorized disclosure of, classified information,’ the memo, which BuzzFeed obtained and posted, reads. Yesterday was a historic day for the S&P 500: not only did the index close at a new record high, but it was also 269% higher than its “generational lows” of March 2009, surpassing the 266% increase during the 1949 to 1956 bull market, according to Bloomberg calculations. And while there is no reason to doubt that central bankers – who no longer have anything to lose from blowing the biggest, hopefully last bubble in history – can push this artificial “market” to unprecedented levels, even taking out the top spot of the 1990-2000 market run which saw the S&P rise by over 400%, others are less sanguine, and in recent weeks calls for an imminent correction have become a chorus. After all, it has now been years since there was even a modest drop in the S&P500, resulting in an generation of traders who are unfamiliar with using the sell button (for those asking, one definition of correction vs a crash is that the former follow rich valuations, but only crashes are associated with recessions). Gold and Yen spiked this morning (right before CPI) on the back of Nikkei headlines about preparation being observed for another North Korean missile launch (following overnight news that US officials had confirmed). Now Reuters reports that defense officials have confirmed to Fox News that North Korea is prepping for a new missile launch and gold and yen are bid once again. On Friday the Department of Commerce will report August retail sales, a material report which all else equal, may influence whether the Fed proceeds with its plans to unveil balance sheet tapering in its upcoming FOMC meeting. However, as we discussed last week, the report, together with virtually all other high frequency economic reports, will be materially distorted by the destructive aftermath of hurricane Harvey (Irma’s impact will be felt in the September retail report). … of particular interest in the coming days will be the biggest driver behind the US economy, namely retail spending, and specifically whether the recent natural disasters led to a sharp – and potentially sustained – slump. According to internal Bank of America credit and debit card spending data released as usual just days ahead of the official government report, there does appears to be a substantial adverse impact. The question is how much of this is secular, and how much is a continuation of recent weakness in retail spending. Further complicating matters is a seasonal quirk, with the August spending report coming at the peak “back to school” spending period, coupled with the recent Amazon Prime Day which led to further distortions in retail spending patterns. We warned two weeks ago that China’s “Bronze Swan” was looming as the crackdown on leverage in the system by Chinese authorities may be forcing unwinds of the CCFDs – thus putting upward pressure on Copper futures (unwinding short positions) and selling physical copper (which would mean procuring the physical metal before passing it on). Those effects were exactly what we had been seeing in the market until the end of August. Barclays has also called the copper rally overhyped, while Bank of America Merrill Lynch said it’s the metal most at risk of a reversal, with the optimism of investors in financial futures disconnected from slow conditions in the physical market. ‘When you look at the state of the refined copper market, you certainly question why prices have risen so significantly,’ Snowdon said by phone from London. So Exactly Which Households Got the Spoils? Not very many. Or why consumer spending has been dragging for years. 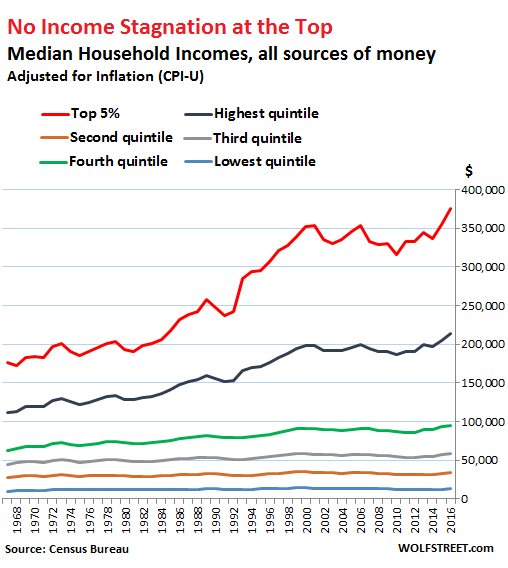 One more thing about the new Census Bureau’s Income and Poverty report for 2016, which found to the great excitement in the media that median household income, adjusted for inflation (via CPI), rose 3.2% in 2016 to $59,039 – finally a tad above where it had been 17 years ago. So now, we’ll look at another data set buried in the Census Bureau’s report, which is based on respondents at 98,000 addresses across the US. We want to know which households were the lucky ones – and turns out, there weren’t very many. This post was published at Wolf Street on Sep 14, 2017. Mainland Chinese buyers have become a dominant force in real estate markets across the world. The Chinese government crackdown on outflows earlier this year severely throttled that money. While this money has been throttled, it’s still appearing in certain markets, most notably the United States. We wanted to know how exactly this is still happens, so we connected with Dr. Joseph Wang – a Bitcoin and Chinese capital outflow expert. Hong Kong-based Dr. Joseph Wang is an OG of monitoring China’s capital flows and Bitcoin. He currently serves as Chief Science Officer at BitQuant, a fintech that specializes in technologies for the upcoming China yuan renminbi equities option market, as well as options and futures for digital currencies. He previously served as Vice President of Quantitative Research for JP Morgan, the sixth largest bank in the world – whose CEO is now an outspoken critic of the cryptocurrency. He’s got a ton of street cred, but even more important – he monitors China’s capital outflows to seek business opportunities.